But since I reserved bars for emergencies, I made excuses to be in emergencies. For example, I would take way too much time getting ready in the morning just so I would “run late” and have a legitimate excuse to grab a couple bars on my dash out the door… hehehe. But now that I’m avoiding added sugars, I have cut out storebought bars. Don’t worry though, you won’t be able to tell these protein bars are healthy! They taste too sweet to be sugar free, too fudgy to be vegan, and too peanut buttery to be considered a healthy food. You’ll definitely enjoy (maybe fall in love with?) 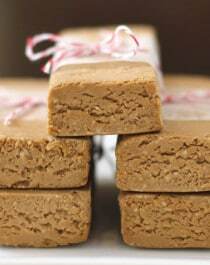 these Healthy Peanut Butter Fudge DIY Protein Bars. 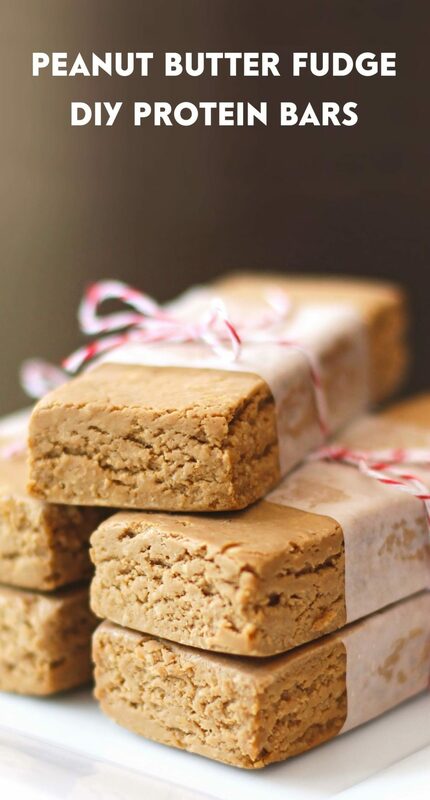 These Healthy Peanut Butter Fudge DIY Protein Bars are super easy to make and don't require any baking whatsoever! One bite of this fudgy goodness and you'd never guess it's sugar free, low carb, keto friendly, gluten free, dairy free, AND vegan too! 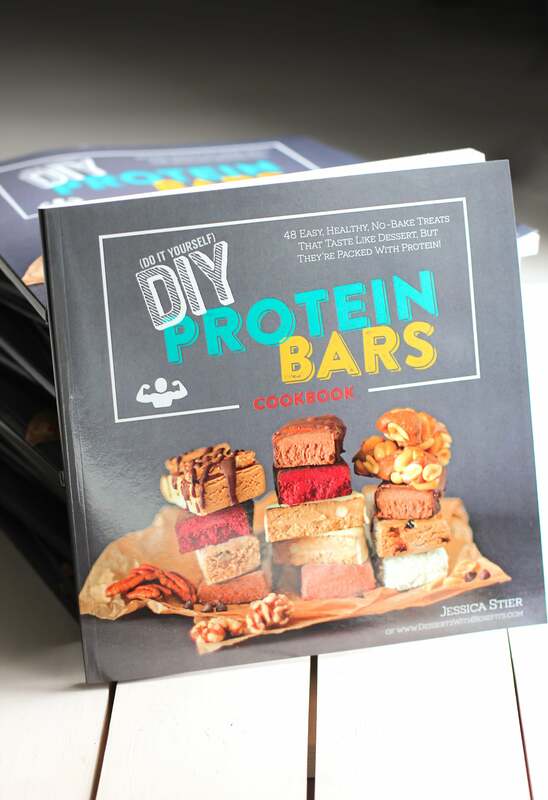 You can find the full recipe and instructions in the DIY Protein Bars Cookbook! I originally wasn't going to share the recipe here because I worked so incredibly hard on publishing DIY Protein Bars. But, I'll meet you halfway... how does that sound? I've provided you with all the ingredients AND measurements used in the recipe! That way, you can determine on your own whether or not the cookbook is for you! If you like this recipe, then you’ll LOVE my DIY Protein Bars Cookbook! With 48 protein bar recipes, you’ll never buy protein bars from the store again. To learn more about the book and see some sneak peeks, see this page! Love these…i wish i could take food like this with me on airplanes because I am travelling to Italy in 2 weeks and these would be perfect!!! Question about your food allergies: Prior to going to college and the change in your diet, did you know you were allergic to all the various products you now know you are? No, I didn’t find out until I met with a registered dietician and got a bunch of blood tests done. I’ve had problems with my energy level and bloating ever since I can remember, but it got worse during my late freshman year in college when I switched exclusively to whole grains, tried to eat yogurt every day, etc. My allergies could have worsened from the stress of being in school, my consumption of these foods nearly every day (especially bagels lol), and the lack of variety in my diet (not that much healthy food available on my campus!). However, I believe that after years and years of eating nearly 100% junk food and not much else, by body wasn’t expecting such a drastic change in my diet and new active lifestyle. In case you haven’t read the About Me page, I used to eat at least 3 Hershey bars a day, and my childhood nicknames usually involved a candy of some sort. Sugar and lack of activity weakens the immune system, so that is what I think happened. But don’t worry, just because this happened to me doesn’t mean it will happen to you or others! If you feel like you have allergies talk to a registered dietician or your doctor and get some blood tests done. Eating foods that you shouldn’t have causes inflammation, stress, and could possibly damage the GI system. Oh wow. I was just wondering how you found out about all of your food allergies. Isn’t it amazing how your diet plays such a key role in every aspect of your life. I see a naturopathic doctor and I absolutely love the eastern approach to medicine, especially for problems that do not need crazy medications. Thanks! Mostly excited for all the delish food!! How many protein bars does this recipe make? These are a perfect snack! I need to make them soon! These bars look great… just like all of your recipes. In some ways, I’m grateful that people have food allergies. They force us to branch out, and, mostly, be healthier. Do you have an idea of whether or not the brown rice powder could be subbed with another protein source? I’m afraid I only have wheys, peanut flour, and a pea/soy/rice blend. these sound great! always looking for good low carb bars! You can probably replace up to 3 tablespoons of the peanut butter with 2-3 tablespoons of a liquid sweetener (such as brown rice syrup, maple syrup, etc). You may need to add a tiny bit more of the oat flour or protein powder (1/2-1 tablespoon?) in order to thicken the dough. Just note that reducing the peanut butter will reduce the flavor, so it would be good to use vanilla protein powder instead of unflavored, or adding vanilla extract. Absolutely fabulous – and amazing photos! Seriously these look to die for! Woah! These look fantastic! My boyfriend eats at least one pre-packaged energy bar a day, and I’ve been trying to find bar recipes with normal ingredients in them that I can make for him to take to work. These sound perfect! I love PureFit bars. I’m definitely going to have to try this recipe. These look spectacular. I can actually see how rich they are. Yummy! Would there be a way to eliminate/substitute the protein powder altogether? Hey, so I just made these and it’s more like goo than very thick cookie dough. They are very sticky and I left in the fridge overnight and tried to cut them – it turned out to be a sticky gooey mess – they do not cut so nicely and look as pretty as your picture. yours look dry and not sticky. i don’t think the recipe you posted is correct. Oh no! 🙁 May I ask what protein powder you used? And did you measure the oats and then blend them? If you followed the recipe exactly I’m not sure what went wrong… I have made these protein bars three times with no problems, Ellie @ Healthy Belly Ellie made this with good results and my friends have made them as well. Since it’s too late to go back, you can try freezing them so they firm up. These look great. I’m hoping to make them tonight because I’ll be traveling tomorrow and would love to bring a bar with me on the road. How long do these generally last in the refrigerator? But they should keep for about a week if they are wrapped and in the fridge. Any ideas would be appreciated…Thanks! Hopefully this works out for you! The recipe makes 10 bars, depending on how wide you cut them. And I use a large sharp knife, about 10″ long. Rice protein powder has been ordered and is on its way. I have been after a protein bar recipe this good for a long time, so here’s hoping it tastes awesome. One question—what would happen if you added some psyllium powder to up the fibre count? Would the bar still come together? EEK! I hope you like/LOVE the protein bars 🙂 you can totally drizzle them with chocolate or fold in some chocolate chips to make them extra delish. I haven’t used psyllium powder before so I’m not sure how it works. If it absorbs a lot of liquid (like flax and chia) then I would add 1 tbs psyllium powder + 1 tbs almond milk, or however much milk to make a very thick paste. Mix it in a bowl first then add it to the almond butter and almond milk in the first few steps. Personally, I would test out the protein bars as the recipe is stated so you get to know how the bars taste and feel. Then you can adjust sweetness and add the psyllium next time around. Either way, good luck! I made these bars today with almond butter and chocolate Sunwarrior because that’s whet I had on hand. Can’t wait to have one for my afternoon snack tomorrow. Have you tried freezing the finished bars? Thank you! I haven’t tried freezing them because they keep pretty well if they’re covered tightly and kept in the fridge, and if you eat (at least) one per day. I hope you looove the protein bars! They are amazing, thank you! The texture is great and I love that I know exactly what is in them. I can’t wait to try some other variations, I’m thinking cashew butter and vanilla Sunwarrior. Thank you again! Your site is a gem! Just found your blog recently–and just made these. Delicious! I used a chocolate protein powder and left out the sweetener, which made them yummy and chocolatey. How do you get yours shaped so perfectly? My edges aren’t nearly as pretty! Maybe I need a squarer pan! Have you ever tried these without sweetener at all? I would rather not use it and I am thinking of trying with smart balance natural pb and vanilla soy protein powder. However you make them though, I hope you love em! Quick question, I made this last night and when I woke up this morning, it was soft and looks like it will not be like this. =( I placed it in the freezer instead, is that ok? I love your blog and your recipes are always so interesting and delicious. Thanks for all the work you do experimenting so we can benefit! No photo credit for you. Such bad blogging manners! Her protein bars must have been ugly. I guess it’s flattering, really!. Anyway, I just wanted you to know. Although, I’ve gotta say it makes me feel a little better about my amateur camera skills, haha. Have a great week! I’ve never used hemp protein powder before so I can’t be sure. Although, in my experience, vegan protein powders are all pretty similar and absorb a lot of liquid. Your recipe lists stevia extract as an ingredient, but the link is for stevia liquid drops. Are they interchangeable? Has anyone tried using honey instead of Truvia or Stevia? Since it does add some moisture to the recipe, be sure to keep some extra oat flour or protein powder on hand. You might need an extra few tablespoons of either or. The dough will be ready once it’s thick and looks like cookie dough, it shouldn’t be sticky. Would they set the same if I replaced the liquid Stevia with agave nectar? I’m afraid agave won’t replace the stevia. You’d need about 1/4 cup of agave to add the amount of sweetness in the stevia, but then the bars will have too much liquid and might not solidify. HI! First I have to say THANK YOU! 2 weeks ago I began a macrco diet and I haven’t been able to find a protein bar that meets my high standards! There are always weird ingredients or if I do find one with organic ingredients the fat and carbs are super high! I made these last night but when I went to cut them this morning they all crumbled. I followed the recipe to the T minus the sweetener. I didn’t add any. Could my sun warrior scoop be bigger? When I placed them in the pan I didn’t get a ball when I finished more like a bowl of meal, however I still was able to smash them firmly into the pan. Any pointers would be appreciated! I want them to look as good as yours! The scoop sizes may have changed… by the end of the recipe the dough should be like cookie dough. I measured the 168g of the protein powder and it should be 1+1/4 cups lightly packed. Thank you so much Jess! I will try that! I’m planning to make the matcha tonight. I’m just obsessed with your site! Can’t believe how beautiful your recipes are! This is like the holy grail for someone trying a macro diet. I love to bake and most of the things I make do not fit my diet. Now they can! Would soy protein work for these and the other recipies that call for brown rice protein? Hi, I was wondering if it’s okay to omit the truvia and stevia from the recipe? Also, can I use regular vanilla protein powder? My other half would die for these! Thanks! I’m afraid the sweeteners are crucial in these protein bars. Without them, the bars will be very bland. By “regular protein powder” do you mean whey? If so, whey doesn’t work in this recipe, only brown rice protein (whey doesn’t absorb the liquid and the mixture turns really sticky). What type of peanut butter do you use? Is there a certain brand you recommend? I always always ALWAYS use natural peanut butter, but I don’t have a certain favorite brand or anything… I usually just buy whatever is cheapest at the time I go grocery shopping. Right now, I like the peanut butter at Costco because it’s all natural and doesn’t have any sugar or oil added (does have a tiny bit of salt though). However, it’s good to shop around because sometimes you can even find organic peanut butter that is cheaper than the regular stuff! I don’t buy Skippy or those major brands because they always have sugar added. Hope this helps! This is a new favorite for me! Look at you doing a recipe video! Woot woot! If you don’t have nut butter in your life, what kind of a life is it, really? This looks amazing! I really want to try it!